How to Grill Broccoli. Ask someone which vegetables they recommend for grilling and you'll commonly hear corn, zucchini, squash and eggplant. However, broccoli is the perfect vegetable for grilling because it stands up well on the grill rack, pairs perfectly with most main dishes and mixes great with other vegetables. Get adventurous at your next barbecue and toss some broccoli on the grill next to the hamburgers and chicken. Buy a stalk of fresh broccoli, looking for tight green buds. Pre-packaged broccoli doesn't work well on the grill because companies chop it into small pieces for packaging. Slice the broccoli stalk lengthwise cutting it into three or four stalks. If your main broccoli stalk is thick, you may need more than three or four smaller stalks. Blanch the broccoli for approximately 3 to 5 minutes or until the broccoli turns bright green. This reduces grill time and helps the broccoli absorb marinades and seasonings. 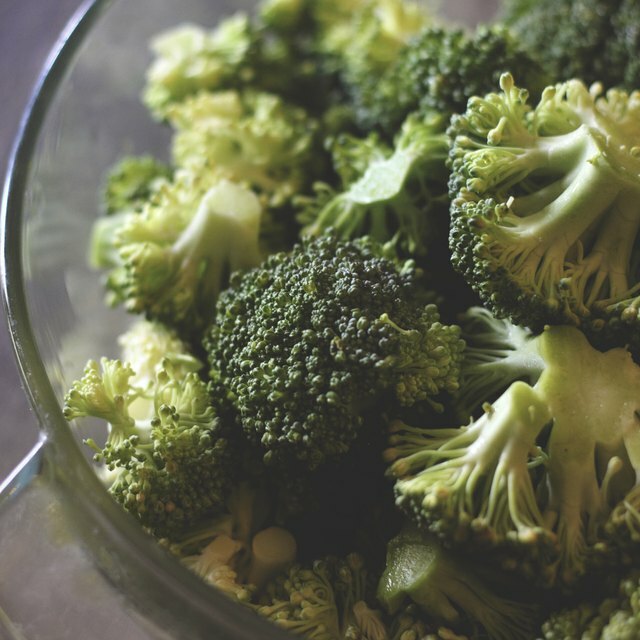 Season the broccoli by using a marinade or sprinkling it with salts. Grocery stores sell marinades for grilling, or you can make a simple marinade of olive oil and lemon juice at home. Spray the broccoli with cooking spray or rub it down with olive oil before sprinkling on seasonings. Use regular salt and pepper, seasoned salt, garlic salt or onion salt instead of a marinade. Place the broccoli directly on the grill over medium to low heat. Grill for 3 to 5 minutes on each side, basting with extra marinade. The broccoli is done when it is tender and slightly charred. Mix the broccoli with other vegetables, such as cauliflower and carrots, and place on a square of tin foil. There is no need for blanching the vegetables because they cook completely on the grill. Season with butter or olive oil and sprinkle with salt. Fold up the tin foil and place directly on the grill over medium heat for 30 to 40 minutes. Cook your broccoli while grilling meat by placing it on the warming rack of the grill. The grill heat should be on high and the broccoli takes about 5 minutes for each side. Can You Cook Asparagus on the Grill?